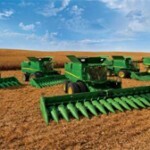 For the expanded 5M Series lineup, John Deere has updated the three highest horsepower models: the 5085M with 85 engine horsepower; the 5100M with 100 engine horsepower; and the 115 horsepower model 5115M, the most powerful 5 Series Tractor available. 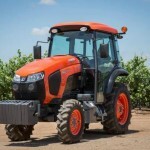 These tractors join the existing 5M models that include the 5065M and the 5075M, but offer customers significant improvements in power, hitch-lift capacity, and comfort and configuration options. New features of these 85 to 115 horsepower 5M models include a five-inch longer wheelbase; 25 percent increased lift capacity; electronic engine control with common rail fuel injection for smoother, more efficient power across all RPM ranges; increased fuel capacity; and Economy PTO. 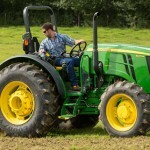 In addition, John Deere offers a new Deluxe Cab option that includes Bluetooth and satellite radio connectivity and auxiliary audio inputs; visibility-improving cornerpost exhaust stack; loader window; brighter instrumentation and easier-to-access controls. Like the new E Limited Series, the 5M Tractors have updated heavy-duty transmissions with increased synchronization in the ranges for easier shifting and self-adjusting, oil-cooled wet traction and PTO clutches for smoother operation and extended service life. All five 5M Series models are available in two-wheel or four-wheel drive; with open station or Deluxe Cab; and with different transmission offerings and many other optional features. The 5M Tractors also come in specialty models such as a high-crop tractor (5100MH) with 24 inches of crop clearance and a low-profile (5115ML) configuration that’s less than 70 inches tall with folded ROPS. “The 5100MH and 5115ML are specifically designed to meet the needs of producers of specialty crops like vegetables, fruit and tree nuts, straight from our factory in Augusta, Georgia,” says Blaylock. 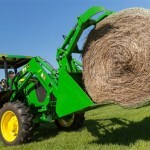 He notes that John Deere loaders and Frontier attachments are an integrated solution to help customers get more work done more efficiently with their 5M or 5E-Limited Tractors. “Take our loader window, for example, which was designed into the tractor cab along with our John Deere loaders to provide optimal visibility to the operator when using the loaders,” says Blaylock. 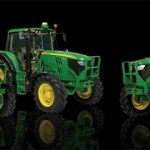 The new John Deere 5E Limited Utility Tractors will be available at your local John Deere dealer later this fall and the 5M Series will be available early in 2012.